closing time: From left, J. B. Kurish, associate dean of Goizueta Business School; NYSE Euronext CEO Duncan Niederauer; and Goizueta Dean Lawrence Benveniste help to close the New York Stock Exchange on September 2. The mood in the Schwartz Center’s Emerson Concert Hall on September 2 could be said to reflect the economy itself: cautiously optimistic. In a high-profile event cohosted by Goizueta Business School and NYSE Euronext and moderated by CNN business correspondent Susan Lisovicz, six business leaders gathered onstage for a panel discussion on lessons of the global financial crisis and the road ahead. Their take: recovery will be slow, but it seems to have begun. From a macroeconomics standpoint, we can look at the financial crisis in isolation, but it really was the breaking point of what I think was a structural challenge our economy was facing. We were cumulatively spending some $700 billion a year, as a country, more than what we were making, which means we were in a borrowing mode. And it was being driven to a large extent by bubbles and assets and people living beyond their means. Now, as result of the bubble bursting, there is a return to fundamentals . . . people are revisiting maybe where they should have been all along, back to saving, back to living within their means. . . . My personal view is that we are likely to become even more global. The growth is likely to come from outside the United States, and if we’re smart as a country, we’ll embrace that. It’s pretty clear that we didn’t anticipate the explosion in the derivatives market that we’ve seen since the modernization act that we passed back in 2000. We’ve got to do a better job as policymakers of trying to project into the future what type of regulation will be necessary. But if we go too far, then we’re not only going to have the potential of driving investors overseas, we will stifle the markets, and we can’t do that. You never want to discourage innovation. But at the same time, if people want the right to innovate, they’re probably going to have to sign up for a little more regulation than we’ve given them. There are lots of opportunities to have smarter application of existing regulation that we know work and that don’t spill over into over-regulation. At the end of the day, it’s supposed to be all about investor protection, right? You can’t regulate what you can’t see, and you can’t risk-manage what you can’t risk-assess. I have seen certain CEOs who have almost movie-star-type status, and now they’re the villains no matter what. . . . Most of us are just average people who have worked our way up and enjoy doing business, and for that we are compensated. I think in an environment where everyone is nervous, transparency is so important. But I still believe the shareholders should ultimately make those decisions and not someone else. One number that I follow very closely is retail sales. That tells you what’s happening in the marketplace and gives you a sense of how the consumer is behaving. The consumer has been traumatized by the last two years and is very cautious. The savings rate is much higher than it’s been in recent years . . . it’s a short-term obstacle to a resurgent economy, but it’s a long-term virtue. The most important thing we hope to see and expect to see is stabilization in housing prices and a significant whittling down of the inventory of unsold houses. Until housing prices stabilize, it’s very hard for consumers to have confidence in their own personal balance sheets, which drives a lot of their saving behavior. It's 3:55 p.m. on a sunny September afternoon, and a sizeable crowd, all holding blue metal cowbells, is gathered outside Goizueta Business School, buzzing quietly with scattershot talk and a collective sense of anticipation. At precisely 4:00, a rousing cheer goes up as everyone shakes the bells at once, creating a surge of sound that carries across the courtyard. And 850 miles away, the lights on the bell podium of the New York Stock Exchange dim for the day. It was the first time the Closing Bell had been rung at a university campus and the first time ever in Georgia. Standing front and center were Duncan Niederauer 85MBA, CEO of NYSE Euronext, the parent company of the New York Stock Exchange (NYSE), and Goizueta Dean Lawrence Benveniste. 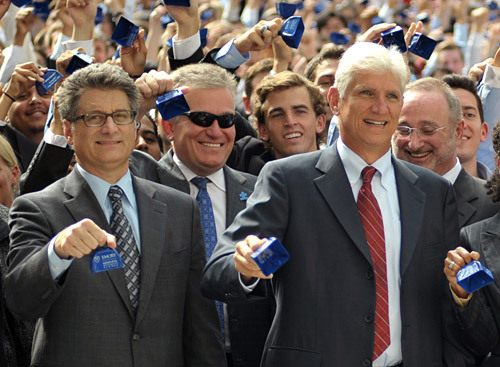 The Closing Bell marked the end of the trading day and the end of Niederauer’s first visit to the Emory campus since he completed his MBA nearly twenty-five years ago. 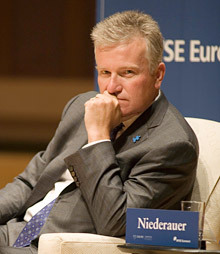 Niederauer joined the NYSE in April 2007, after a twenty-two-year run at Goldman Sachs, and became CEO that December. He brought with him a deep knowledge of the technology behind electronic trading—an area where it was clear the NYSE needed to advance. But no one could have anticipated just how critical that background would prove. Niederauer began building the NYSE’s technical infrastructure and capacity almost immediately after his arrival, hiring Lawrence Leibowitz as head of U.S. execution and global technology. They replaced the outdated platform that ran the Big Board with strong new servers and increased bandwidth across the system. When the first waves of the economic crisis began to break last fall, the NYSE was ready for the massive surges in trading volume—demands that, a year before, would probably have crashed the system and dented customer confidence. The NYSE is a privately held company that went public after a 2006 merger with an electronic exchange, Archipelago Holdings, followed the next year by another merger with the also-electronic Euronext. The company faces heavy competition from other global exchanges, such as Deutsche Borse of Frankfurt and the London Stock Exchange Group. Stock prices in September hovered around $30. At the same time, the NYSE has a history dating back more than two hundred years and is the largest and most influential (though not the richest) stock exchange in the world. Its buildings at New York City’s 11 Wall Street and 18 Broad Street are National Historic Landmarks; legendary tales of its aggressive atmosphere and make-or-break floor trading—not to mention defining moments like the stock market crash of 1929—are the subjects of countless books and movies. In the American mind, the exchange is as much a public institution as a blinking symbol on the Big Board. As an undergraduate at Colgate University, Niederauer majored in economics but took almost as many English classes, graduating one class shy of a double major. The verbal and written communication skills he honed in those courses on Hawthorne and Lawrence are as important to him now as the foundation in economics. “You meet an awful lot of business people who just aren’t comfortable with that part of the skill set,” he says. Niederauer came to Atlanta after college to manage a restaurant owned by a Colgate alumnus. He knew he wanted to pursue an MBA, and when Goizueta Business School offered him a Woodruff Fellowship, the opportunity was too good to pass up. It was here that he met longtime friend and colleague John Halvey 86L 86MBA, now serving as general counsel for NYSE Euronext. During more than two decades at Goldman Sachs, Niederauer served in many different roles, including global head of portfolio trading and head of equities and e-commerce. He spent three years in Tokyo heading the derivatives and Japanese products business. In recent months, though, Niederauer has found himself on a plane to Washington as often as to China. As President Obama and Congress debate financial regulatory reform in the wake of the economic crisis, Niederauer is increasingly among those tapped to provide expert advice and unbiased perspective from the financial sector. That’s a responsibility the NYSE shouldn’t shirk, he says, because of its historic position.